so the boston trip to see a facebook friend looks pretty uncertain as i head for o’hare on sunday morning. i sorted out with the t.s.a. that even if my ticket said ‘arlynnmissl” that’s the same as “miss arlynn l” and then they STILL wanted to feel me up! i got to ride first class for the first time because of my facebook friend tommy chang who took my steerage ticket and upgraded me. i felt like a princess when the flight attendant asked if he could hang up my coat. but i was still uncertain as to what i would find in boston. would i have to just hang around until my flight home? would i visit lisa in the hospital? would i find her at her home? was i an intruder? i get very bad anxiety attacks when i leave my home. well, hell, sometimes i get them when i’m in my house too. but i’m an avoider, an excuse maker, a “sorry i’m busy” person. i want to be social, i want to see the world, i want to be out there, and yet what holds me back is the anxiety AND the certainty that i’ll have an anxiety attack and totally embarrass myself or lay myself open to the Hobbesian truth that nobody cares about anybody else. thomas hobbes was a seventeenth century english philosopher who thought people had not one bit of love for one another. 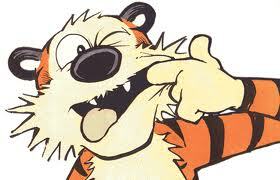 this is not a picture of thomas hobbes, but rather of the cartoon character from calvin and hobbes. if i have an anxiety attack in public, i assume that thomas hobbes will be proved right. the world would be a nicer place if the cat hobbes were correct. so now i am in boston, and just a few hours from meeting with my facebook friend lisa tabbi-fuller. it was her birthday yesterday. i hope today is the beginning of a really fabulous year! and it’s going to start with us doing the thing that scares her the most. . . This entry was posted on Monday, January 30th, 2012 at 1:38 pm	and tagged with agoraphobia, calvin and hobbes, drug therapy for anxiety, f2fb, facebook, friendship, lexapro, panic attacks, talking therapy for anxiety, thomas hobbes and posted in Uncategorized. You can follow any responses to this entry through the RSS 2.0 feed. « on wednesday mark zuckerberg will send us a nice thank you note! Hope all is going well in Boston. Just wanted to share my story about SSRI’s. I grew up in a very dsyfunctional household. Mom was Bipolar and an alcholic. Dad had extreme anxiety issues and an alcholic. Both were the sweetest people in the world but when their demons came out it was horrid. Parents fighting so loud until the neighbors called police. etc. I started having symptoms of anxiety in the 3rd grade. All through grade school I missed 40-50 days a year due to “illness”. After grade school things improved a bit. I learned how to float on the river of life letting it take me wherever but really offering no effort to find other things. All my friends went off to collegge. I stayed home at Junior College. Eeeked out and extra hal year. Then society told me I should go away to a 4 year school which I did. One that was only 60 miles away. Although home had been toxic, it was still my safe zone. After two months living in a dorm the panic attacks and no sleep started. After a few weeks I left school to go back home. In the fall I went back on my own terms. Changed my major to communications. Lived off campus with my older brother. Graduated in 1980. Moved out of my parents home at 25. Lived on my own got an OK job. Met a girl. I married the first woman I had a relationship with. Really fell hard for the chemistry of love. Wow this is getting long. Let me know if you want me to fill in the details. I’ll cut to the chase. With 3 young kids under 5 my wife had an affair. Decided she wanted a divorced. Demaned I move out. When I did I crashed and burned. 3 months of total hell. Day hospital. Medicine and therapy that wasn’t working. Sleep gone. Thank god I ended up at a different hospital. They gave me Klonopin and Paxil. The first night I slept 4 hours the next night 6. The more I learned the weaned off Paxil, not pleasant and startd taking Celaxa. Now I’m on the generic, citalopram. The medicine has not made me something I’m not it has allowed me to be me. 16 years on SSRI’s. Yes I have gained weight. But I have been raising my kids on shared custody. Survived a job loss after working there 22 years. Support myself with my own business. All things I don’t believe I could have done without therapy and SSRI’s.